The iPanda is basically an updated but slightly cuter (in my opinion) version of the iPig we raved about earlier this year. It incorporates the exact same specs,as both have 25 watts of sound,a cutesy case and a mouth that lights up when it’s happy/turned on. 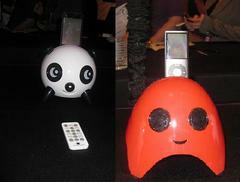 The iPanda is iPod compatible and plays sound in 360 degrees, due to its its unique 5 speaker design. What I am excited about though is the yet unnamed iGhost which looks like a character from Space Invaders and was displayed on the Speakal stand. With no official name, and no release date I’m going to push the boat out and guess it will have the same specs as the other Speakal devices, which hopefully means it will also retail for the same $139.99. Fingers crossed it will come in a variety of cute colours as well?When I know more, you will too- watch this space!